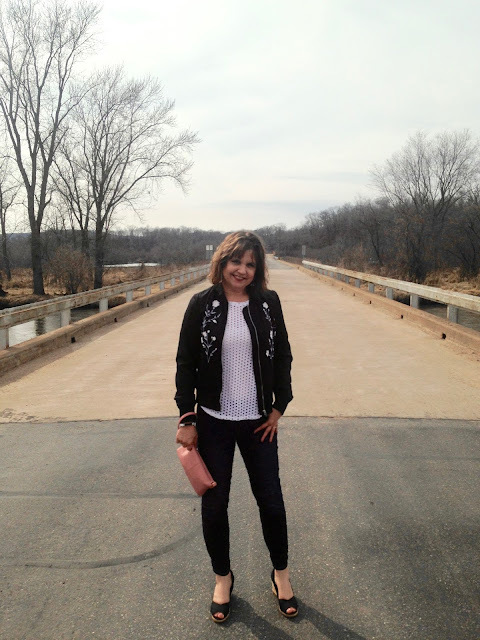 O.K., if you remember THIS POST, I shared how I had been searching for a bomber jacket for two seasons or more and I could never find one I liked. I finally bought a plain burgundy jacket for $20.00 at our local Macy's "Going Out of Business Sale". I said in that post that I didn't want a black or embroidered jacket; and look what I just bought: A black, embroidered bomber jacket! I couldn't help myself! It was so pretty. And quite frankly, I said I didn't want one because I already had a black moto jacket, but a black bomber jacket is totally different. And I also said I didn't want an embroidered one because I found most of the embroidery on the bomber jackets a bit on the tacky side. The embroidery on this jacket is GORGEOUS! Plus, the burgundy color of my other bomber jacket does not go with most of my spring clothes, but black goes with everything. So I will get a lot more use out of it. O.K. do you think I gave you enough excuses for buying yet another jacket I really don't need? Oh, and I forgot the most important one. My husband LOVES this jacket. He went on and on about it the entire time I was wearing it. Score! I wore my new bomber jacket with another new purchase: a.n.a. Skinny Jeans. In my last fashion post I shared that I donated a third of my old clothes; and I got rid of a lot of jeans. It was pretty heart breaking, as I owned a lot of expensive jeans. But they were all low rise or made of regular denim. I really only want jeans made with stretch denim and a higher waist line, and these fit the bill! I also want skinny jeans that have that slim leg look without CLINGING to my leg showing every bump and bulge. These are perfect! They are slim fitting, but they don't cling. 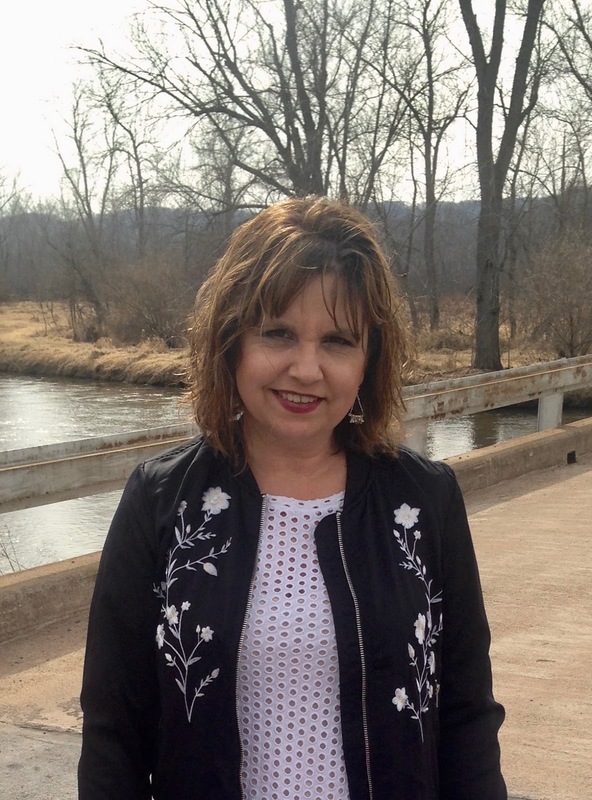 Underneath my bomber jacket I wore an Old Navy eyelet top that I bought a few seasons ago. The last time I showed you this top was HERE. If you're looking for a bomber jacket, this one is still available HERE. It also comes in other styles and colors. 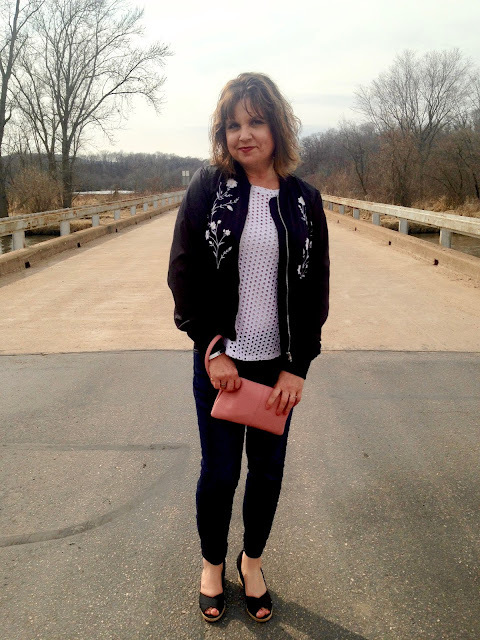 I really love the blush jacket and I am having a hard time resisting not buying that one too! It's so pretty, and it would be perfect for spring. Hmmm, maybe if I get another coupon? I didn't wear a necklace because of all the detail going on with the eyelet top and embroidery, so I wore chandelier earrings instead. What sold me on this jacket was the gorgeous embroidery. It's just the right amount for my taste. The embroidery allows me to wear this jacket dressed up or down. If it were just plain, I don't think I could wear this jacket with more dressy outfits. 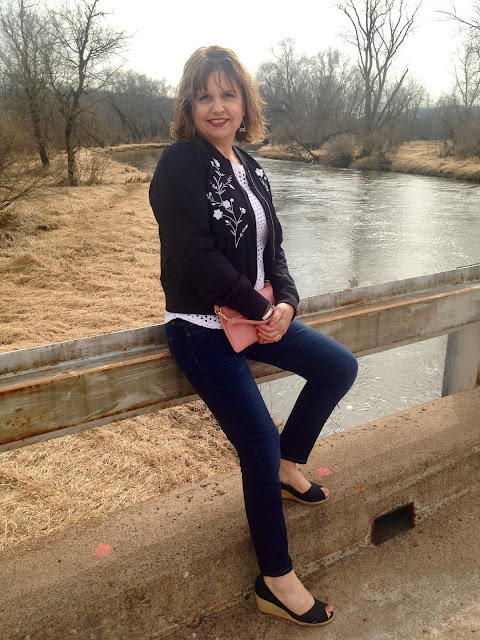 I stuck with the black and white theme by wearing a black and white bracelet on my wrist, but I added some color to my outfit with a blush handbag from Charming Charlie's. Because it is finally SPRING, I can show my toes once again! I went with a peep-toe black canvas wedge (old). 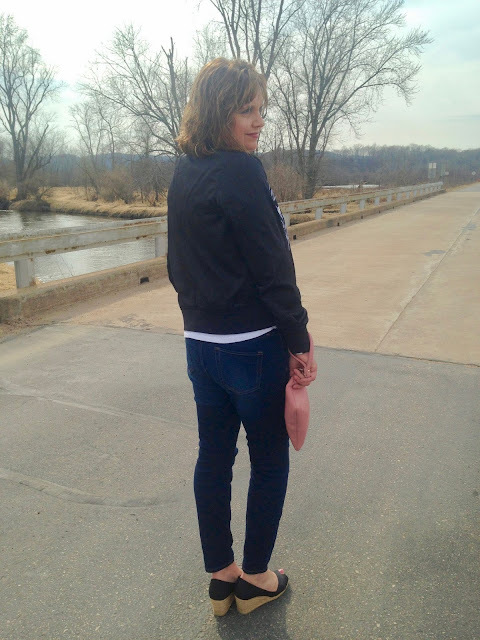 I did size up when I bought the jacket because bomber jackets should appear over-sized, plus I like a more generous fit so I can wear whatever I want underneath. This is a size Large. It's so nice to be able to wear something other than a winter coat for a change! Hopefully we've seen the last of winter here in Wisconsin. What a great look Amy. Well worth being naughty for! And your spot on with the jeans. This is how I prefer them too. I'm just moving on to looser fitting leg wise. 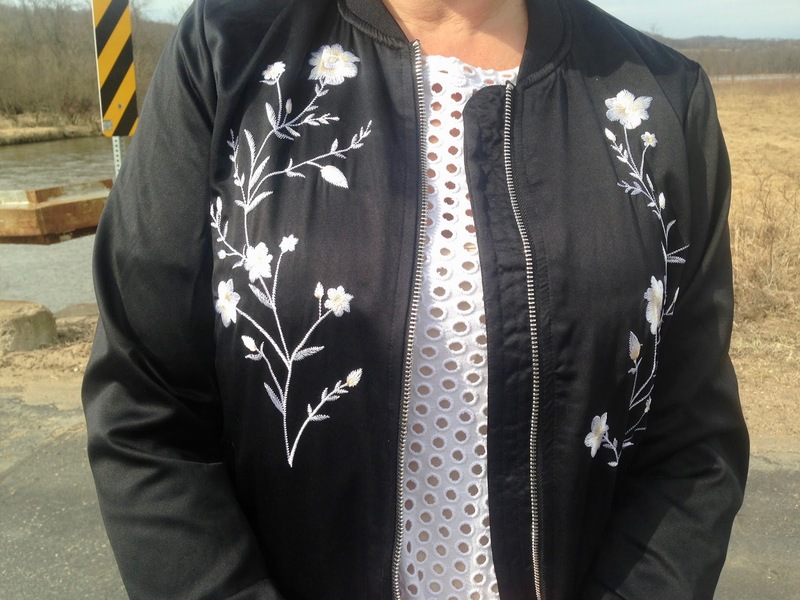 I'm loving this embroidered bomber jacket! Such a great piece to have in your closet for spring, and those jeans look great on you! Thank you! Let me know what you think of the jeans. I absolutely love them. Oh that jacket is adorable! I love that the embroidery is just white on the black jacket. 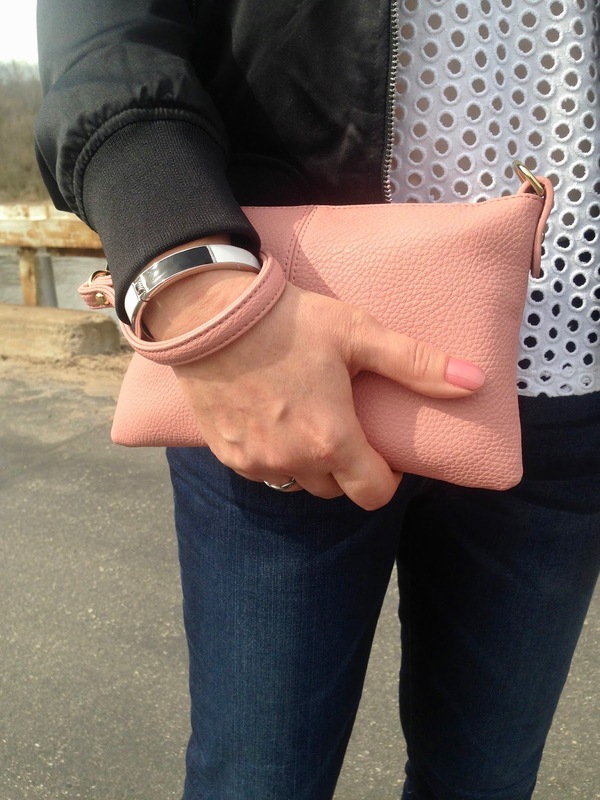 It is going to be so versatile for Spring and Fall. I think I have 5 bomber jackets now! Eek. Is that bad? Thanks for linking up with me this week! The embroidery is so cute! I love the trend and this is perfect for your Spring closet! You look lovely! This bomber is TOO CUTE! I agree, you needed it. And at least your husband raves about it! The jeans are perfect on you. I'll have to check out that brand. ha-ha! Thanks for confirming my purchase! Oh, you would fabulous in a bomber jacket! You need to get one! Very cute bomber jacket. The embroidery is so pretty for spring. Cute jacket and jeans, Amy. Longing to get my toes,our but must wait for pedicure next week. Thank you! I've never had a pedicure in my life. Someday.